“We should carry three tasks namely mandatory fuel economic standard, improvement in quality of fuel and fiscal policy regime. 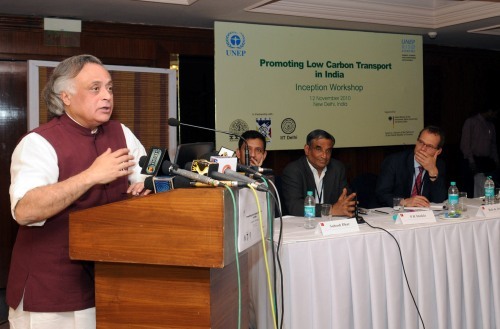 The immediate task ahead at us is to have Mandatory Fuel Economic Standards.”, announced Mr. Jairam Ramesh, Minister of Environment and Forests (I/C) in his inaugural speech at a workshop on ‘Promoting Low-carbon Transport in India’ in New Delhi today. Referring to improvement in quality of fuel, the Minister said that substantial work has been done in this area. He also informed how quality of fuel is critically linked to mandatory standards and that large improvements are required in fuel quality. At the workshop, Mr. Ramesh also informed that the Mandatory Fuel Economy Standards have been finalised and will be notified under the Energy conservation Act and not under the Motor Vehicle Act. “The standards are all ready with technical work and by end of this year we should have voluntary mandatory standard. This will be KMPL standard route which will depend on weight of the car, size of the engine etc.”, he said. The Minister further announced how the luxurious growth of large size vehicles and SUVs is a cause for great concern. He suggested implementing fiscal policy regime that discourage the use of heavy cars and SUVs particularly and put penalty use of these vehicles. The subsidies which are given for fossil fuels should be for farmers, LPG etc. which is used by big vehicles. Giving details of GHG emission of various sectors the Minister said the transportation sector accounts for 7½ % of our GHG emissions. 38% is electricity, 23% is industry, 17% is agriculture and 7½ % Emission is from residential sector. According to Mr. Ramesh, the growth of cars will not allow curbing emission and it will be doubled by 2025 as the transport sector is growing at an alarming rate. It adds to mobility to individual, but in term of GHG emissions, at very heavy social cost. Taking pride in the GHG Inventory brought out by the MoEF, the Minister said this is the most important GHG inventory the country has ever produced. The inventory reveals that about 38% of our emissions come from the electricity sector making it the single major source of our GHG emissions. One option that often surfaces in fossil fuel and sustainable transport debates is that of biofuel especially with reference to the transport sector of Brazil. Mr. Ramesh however declared that the use of ethanol as a fuel is not possible in India as this is a land deficit country. We do not have flexibility for land use as food security is most important objective in India. India’s National Action Plan on Climate Change (NAPCC) recognizes that GHG emissions from transport can be reduced by adopting sustainability approach through a combination of measures like increased use of public transport, higher penetration of biofuels, enhanced energy efficiency of transport vehicles, etc. The particular workshop which was the inception workshop for promoting low carbon transport in India and endorsed by the MoEF aims to contribute to this national agenda of sustainable transport, especially in our ever expanding cities.